In 2017, I worked with Three Rivers District Council, Abbots Langley Primary School and First World War historian, Roger Yapp, from Back to the Front to deliver a series of clay projects to commemorate the Centenary of the First World War. In 2018, Back to the Front have been successful in their Heritage Lottery Fund application and we are building on the success of this initial workshop to create a new war memorial for Abbots Langley and Bedmond in remembrance of the WWI Centenary. In his book Somme Mud, Infantryman Edward Lynch wrote about his time in the Somme trenches as a means of coming to terms with his wartime experiences. Images of the atrocious conditions are synonymous with deep mud, which saw men, horses and military equipment sink into the earth. We wonder what still lurks in the ground today – objects lost in a muddy wasteland which were important to somebody a hundred years ago. How can we stop the memory of soldiers and the important reminders of the First World War from disappearing into the mud? Clay is of course earth, and no different to mud in its natural state, however by firing it in a kiln, it is possible to transform it into something permanent. This clay workshop will enable students to work with a material directly related to the conditions suffered by soldiers during the War. Each student will create a memorial plaque or tile working with a variety of motifs and textures to commemorate this period in our history. Thinking about the kind of objects that we may find in muddy Nomansland, we will consider how archaeologists can piece together an impression of what life was like for First World War soldiers. Common objects to include in the impressed tile might include buttons, badges, replica medals, footprints, horseshoes, tyre tracks (from toy vehicles), wheels, hessian sacking, etc. In addition, each student will be given the name of a real, local soldier from the archives or war memorial to include in their finished tile using letterpress techniques. This will create a permanent reminder of the conditions suffered by real local soldiers, and serve as a chance to consider how objects tell stories. With each student producing unique work, it is hoped that this will be a reflection of the many, many individual stories of those who perished. 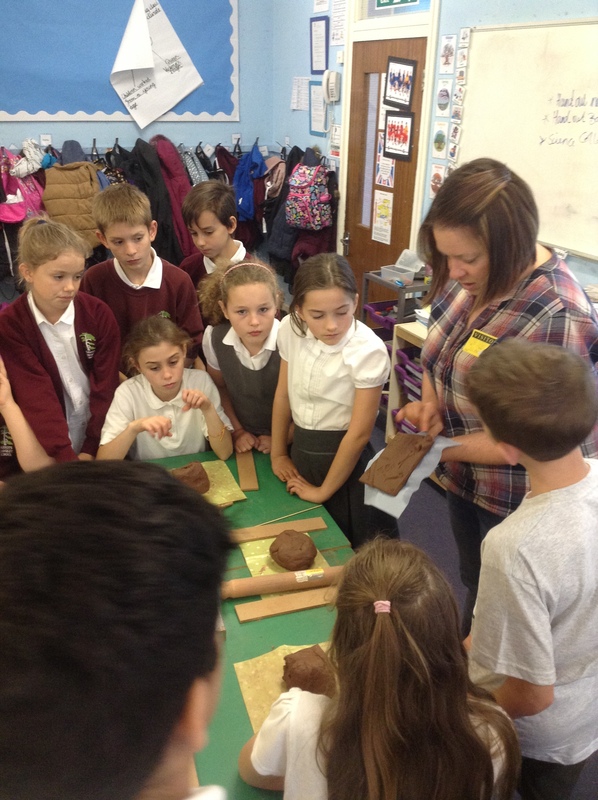 Often in clay workshops, students enjoy talking about the sensations of working with such a messy material. Some dislike having dirty hands, others enjoy the freedom to be messy. From a sensory perspective, the clay will enable students to imagine what it would have been like to move through the muddy wastelands in uniform and carrying heavy equipment. During our pilot project, pupils from Abbots Langley Primary School made a fantastic collection of tiles, each bearing the name of a soldier from the village. It was possible, thanks to Roger’s amazing research project, for pupils to actually be allocated the names of soldiers who actually lived on the same road. It was surprising how well this enabled children to connect with their local history, elevate the fallen soldier’s from a simple name on a memorial to a real affinity with a person who once lived in their village too. How does this relate to my own creative practice? I have been particularly interested in working on this significant project. In my own work, I am fascinated in how objects can signify stories, whether that may be a museum relic, tideline treasure or a beloved family heirloom. As the First World War has now passed from living memory, I am considering how such an important moment in our history will become codified and commemorated in almost every community in the country, and how we might create a new memorial to reflect on this important moment in our history. Simple and ordinary objects can be used to explore extraordinary stories. Now with over 200 tiles completed, we will be firing and glazing before assembling the final war memorial in time for Remembrance Sunday 2018. This page will be updated as the project progresses.